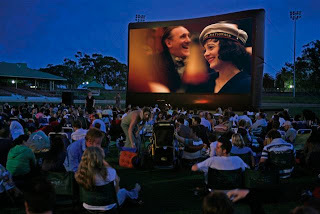 There is a sort of revival in open air cinema in Brisbane. People see it as a novelty - taking a blanket and a picnic basket, sitting out under the stars, and watching a movie. These events are normally run during spring, when the weather is balmy and there is less likelihood of a Brisbane thunderstorm to drench the patrons. 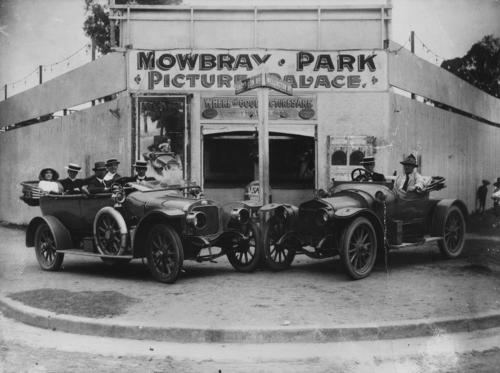 "the cars in the foreground were advertising the Movie to be shown called the "Kissing Cup's Race"(1931)." There was a lot of competition in the movie business in those early days. 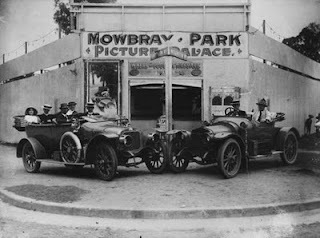 There were five cinemas within a radius of a couple of kilometers of the Mowbray Park Picture Palace during the 1920s, including the one we are looking at today. Unfortunately I have not been able to find an old picture of it to show you, but it is known as the Classic Cinema in East Brisbane. This is what it looks like now. Also originally an open air cinema, movies started here in 1921 when a Frederick Olsen started showing silent movies on the site he had recently obtained. Frederick Olsen died in 1926 and a year later his son Vigo raised money to build a new fully enclosed cinema. The building was probably designed and constructed by Arthur Robson who built many theatres throughout the state. Police are investigating the disappearance of £30 in coin and notes from the office of the Triumph Theatre In Withington Street. East Brisbane, on Saturday night. Mrs. I. E. Olsen. of Didsbury Street, East Brisbane, who is employed as a ticket-seller, placed the money and tickets in a small bag, ready to be taken to the home of Mrs. G. V Jones, wife of the manager, at Mt Gravatt. Mr. Jones said the loss was discovered about 11 o'clock, shortly before the session ended. The office was unoccupied for a time, and when Mr. Jones's mother, who owns the theatre, picked up the bag she noticed it was rather light. She examined the contents, and found that the money was missing. The Triumph experienced fluctuating fortunes since those heady days of near-capacity patronage. The post-war advent of television knocked numbers around considerably, and many suburban cinemas struggled after that. The Triumph was renamed the Capri in 1970, and existed by showing R-rated movies to satisfy the T&A crowd. Alvin Purple and European equivalents like Dagmar's Hot Pants and Bedroom Mazurka evidently paid the bills. Movies that were raunchy then, but seem hideously cringe-making now. Even that clientele must have dropped off, because the cinema closed in the early 80s before reopening in 1988 as the Classic, showing cult and art house movies. The cinema closed for good in the year 2000, and since then the building has been recycled into a martial arts dojo. Kung fu devotees no longer have to imagine themselves in a Bruce Lee movie - they can participate in the real thing! The building is listed on the Queensland Heritage Register. I imagine that in tough times, like the Depression, people loved their night at the pictures passionately. A two hour escape into fun and fantasy. No wonder the theatres were near capacity. But what I didn't realise was that there were suburban theatres in the inter-war period that were roofless. Everyone over 50 remembers the drive-ins with delight, but I assume you mean cinemas where the customer sat in the open air, not inside their own car. I wonder if that happened in the southern states. It would have been even gutsier to have the live theatre venue, the Cremorne Theatre, as an open air site. I remember seeing The Globe in London and Oberammergau in Southern Germany, and thinking about unpredictable weather. I guess in the pre-A/C days of Queensland, it was the cheapest way to keep the cinema cool. They had to have walls with no windows to encourage people to pay to enter the cinema to see the movies - otherwise people could just look in from outside. Ah, the good old Classic, I remember going to watch Lawrence of Arabia there in the late 80s just after I arrived in Australia. Nice to see it still standing. 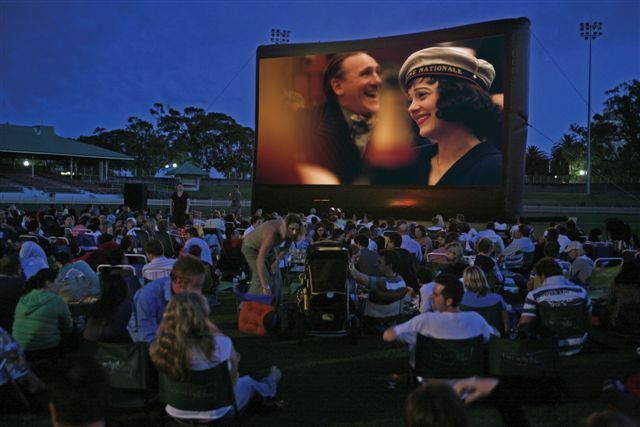 The open air screenings in Brisbane started back in the 1900s and bridged the gap between variety shows and cinema. You'd get up to 5,000 people turning up to Dutton Park on a Tuesday night to watch live singers, acrobats, concert bands, and then a string of silent shorts. These entertainments were known as the 'Continentals' and were staged at a few places around Brisbane, like Woolloongabba and Paddington. They were run by Mr Carroll, later of Birch, Carroll & Coyle fame. They died out during the mid-1910s due to the rise of cinema houses, which offered all-weather certainty.